Corrected 4/18/09. ann I am found an error in the formula for X. Corrections are noted in red. 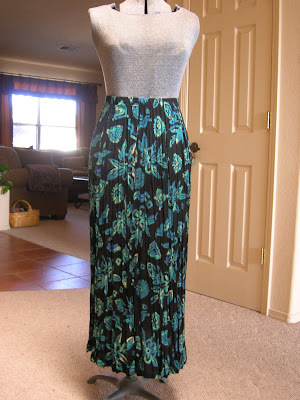 This is my favorite way to make a broomstick skirt--a more flattering silhouette and it uses less fabric. I made this one in 2006, using some Carole Little rayon that I had on hand. This is a view of the skirt, stretched out so you can see the actual shape better. The broomstick pleating draws up the skirt considerably, but the pleats relax a bit with wearing. For reference, I was working with a 3-1/2 yard piece of 58" wide fabric. If I were making it today, it would be shorter but still calf length. I'm sure my friend Leslie is not the only person to have come up with this idea. But Leslie is the only one I personally know who's done it and written it up for my ASG chapter. She has also given me permission to share. Keep in mind that she's an engineer by training and career, so that means there will be math. I will try to interpret as warranted. I'm transcribing her instructions verbatim with the help of scans. My comments will appear in italics. This is for everyone who has asked me for my broomstick skirt pattern. 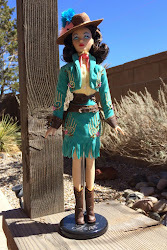 This version of the skirt diminishes that "barrel" look that we see so often in the tiered variety. (I don't know about the rest of you, but I don't want that area from my waist to my knees appearing any bigger than it is!) Everyone should have their own individual pattern that is tailor-made to their size, desired skirt length and the width of their fashion fabric. The following method utilizes the fabric effectively, leaving very little scrap. As you will see, this pattern also halves your cutting time. Please note, if your fabric has a noticeable nap or a one-way design, this method of cutting is inappropriate. You will be drafting one pattern piece, which you will use to cut every one of the skirt panels. Before you start, you need to know four things: how long you want your finished skirt to be, your fullest hip measurement, your fashion fabric width and how many panels you want your skirt to have. (When you buy your fabric, you need to buy a little more than twice your desired skirt length plus 4 inches. If you are buying 45 inch wide material and your hips are larger than 43 inches, you will need an extra 8 inches instead of 4. You will have to piece your waistband, but no one will notice). X equals half of panel’s top edge, and Ct equals fullest hip measurement plus 2 inches. The reason why X is half of the panel’s top width will become more clear when you draw the pattern piece. Put that x value into one of the next three formulas, being sure to use the one that corresponds to the number of panels you are planning for your skirt. This calculation will give you a y value. You need to calculate both the x and y values to be able to draft your pattern. The pattern will look like a trapezoid when you are finished. The resulting skirt will measure the same, regardless of the number of panels. However, the size of the pattern piece is different depending on which option you choose. In all 3 formulas, W equals the width of the fabric and Y equals half of the panel’s lower edge. This makes more sense when you draw the pattern piece and when you cut out the panels. Remember, Leslie's an engineer. I'm not sure how she derived these formulas but they work. 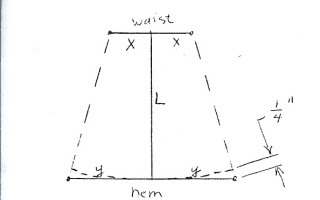 On your pattern paper, draw a long straight line equal to L, your desired skirt length plus 1 inch. This will be the center of your trapezoid and will be on the straight of grain when placed on your fabric. At one end of the line measure out at right angles your calculated distance x. Make a big dot. Do this on both sides of the line and connect the dots. At the opposite side of line L, perform the same operation, but use your calculated y value this time. You should have a figure that looks like the capital letter "I" but with the base wider than the top. Connect each top dot with a bottom dots and you should see a trapezoid. Your typical flared skirt does not have a straight hemline. You will need to draw in a gentle curve by eyeballing it or using a long French curve. As a rule of thumb, I measure up from the hem by about 1/4" on the legs of the trapezoid and make the curve intersect those two points as well as the end point of centerline L. The illustration above shows the curving of the pattern piece. I'll also mention that I don't re-draft every time the variables change. I just went ahead and made patterns for 10, 12, and 14 panels and go straight to cutting. You have completed your skirt panel pattern and you are ready to cut fabric. Your fabric should be folded in half lengthwise, selvage to selvage. The fabric length is two times the skirt length L plus 4 or 8 inches for the waistband. 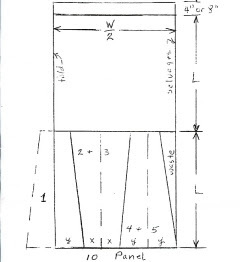 The scan above shows the layout for a 10-panel skirt. The layout shows the 5 of the 10 panels only; you repeat for the second 5. Same thing with the diagrams below. Start by placing the centerline (L) of your pattern on the fold, which will form a complete panel once cut and unfolded. Rotate the pattern piece 180 degrees and place it back on the fabric. The cut edge you just made should line up with the pattern piece's edge, and the centerline will still be on the straight of grain. Cut the remaining 3 sides. You have just cut panels 2 and 3 (remember you are cutting a double thickness. Rotate the pattern piece 180 degrees again and place it back on the fabric, lining up the edge of the pattern to that freshly cut edge of fabric again. Cut. Now you have 5 panels. At this point, you can see that the remaining 5 panels will be done in exactly the same way on the remaining section of your fabric length. The scans below show layouts for 12 and 14 panel skirts. Now it's time to sew!! Leslie (and I) do everything except the hem and waistband topstitching with a serger. Right sides together, using 1/4" seams, stitch all but one seam together. Be sure to line up the waist edges and the hem edges together when sewing the seams. Serge the waistband to the skirt's upper edge right sides together, lining up the edges of the waistband with the raw edges of the skirt seam. Serge the remaining seam together, connecting skirt panels and waistband edges at the same time. Since I've started sewing Loes Hinse patterns, I use her waistband technique instead of installing a separate casing. If you do this, then be sure to add additional length at the waist edge of the pattern piece equal to at least 2 times the width of the elastic you'll be using. Because Loes' technique doesn't need a separate casing, you will also go ahead and complete the cylinder at this point. Sorry, I'm not going to explain the technique here. Now the skirt is a complete cylinder and is waiting for you to make a casing and insert elastic. Depending on your elastic width, you may need to trim away some of the waistband's width. Finish the skirt hem with a 5/8" machine hem (or make a rolled edge on your serger). 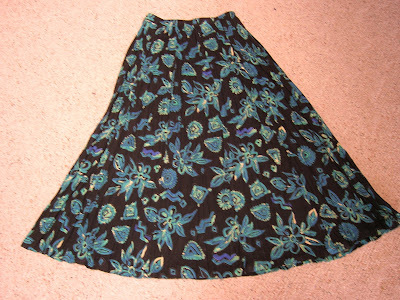 You are ready to "broom" the skirt using your favorite method. I'll explain my method in another post. Leslie says, and I agree, on the following: when you are selecting fabric for your skirt, look for lightweight rayons, silks, and cottons. Cotton is not our favorite because the broomed fabric seams stiff and boxy. Also, avoid anything with polyester content, as it won't take or retain a good pleat. Oh this looks like fun. Still have to find the fabric though. I'll check the (copious) stash first. Thank you, thank you for all this valuable information. I realize that I was working with my skirts completely wrong. I used no stick, starch, or hose. I just twisted and made a knot; no one I looked like a KNOT in them LOL. The last sentence above should say: No wonder I looked like a Knot in them. I need a spell check or a word check. I stitched up TWO of these last night and am off to buy starch to complete the project. I got confused with this bit and wonder if it's me, or the way the formula is expressed? "divide Ct by 2, multiply the result by the number of panels"
If your hips are 36 inches (hahahahaa-mine are not) the result would be 180.25 inches for a 10 panel skirt. I think it should read: divide CT by 2 times the number of panels. Anyway, thanks for posting the great pattern. ann, I think you're correct. I'll check that tonight. My preference would have been to leave the formulas as originally written by Leslie. However, Blogger doesn't like formulas much. It was driving me buggy writing them in this post. HELP!!! I got the formual to arive at "X=" but I don't understand how to get to "Y=". Y= (W/2 - 2X) /3. Am I suppose to double "X"? I'm a little lost.